Let's chat about what an ordinary day of adulting really looks like, shall we? You wake up via an annoying cell phone alarm, after ever-so-gracefully hitting the snooze button about three times. Then you stumble out of bed and commence your daily routine of making yourself look half way decent and head to work. After a long day's work, you come home, have dinner and shoot the breeze (possibly watching Netflix or Hulu) until you go to sleep and do it all over again the next day. Here's the deal - it's incredibly easy to live that same exact story over and over again - day in and day out. That's where vision boards come in. A vision board is a visual representation of all the things you want to accomplish over a certain period. While it's common use a poster board to build your vision, you can create a vision board using any medium that fits best with your style. I like to do create a vision board at the beginning of the year instead of setting a New Year's Resolution because I love having a huge canvas each year to set goals in every area of my life. Vision Boards Give You A Reason To Reflect On What You Want Out of life. In any given day, you can point out the things you don't really enjoy about your life. You can also daydream about things you'd want to accomplish if you had only the chance. Thinking about these things every day means absolutely nothing if you don't make an effort to fix them. Creating a vision board is your opportunity to reflect on your life - the good and the bad - and redesign your story. Through your vision board you can set goals to do more of the things you enjoy about your life and less of the things you don't enjoy. Your vision board is your escuse to take a moment to think about your needs and focus entirely on your action plan to make it happen. My favorite book for exploring your self, your desires and your destiny is The Alchemist by Paulo Coelho. A friend gave this book to me when she realized I was struggling with adulting and needed a serious lifeline. Now I recommend it to others. Your Vision board serves as a constant reminder of your goals. The real power in vision boards is the daily interaction with them. 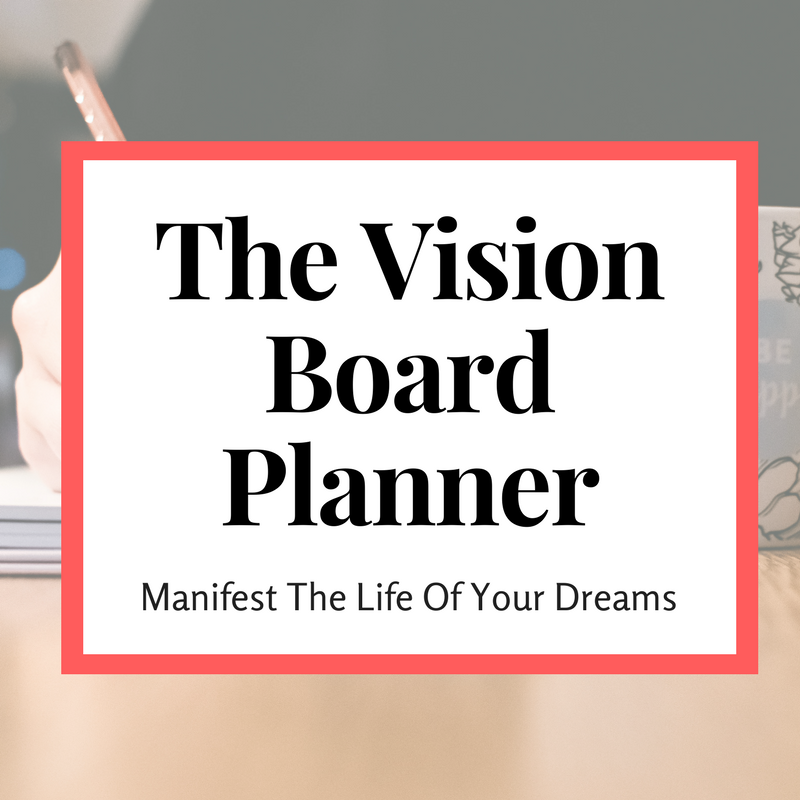 If you put your vision board in a place where you'll get to see it every day, it will begin to train your mind to think about the things you want, even when you're not necessarily thinking about them or focusing on them. While you may have had difficulty focusing on accomplishing your goals, your vision board will be your point of focus. Depending on what you put on your board, you're placing yourself in the position to solve those problems or focus on those goals even when you're not trying. The most powerful thing about the vision board is that it's your own blank canvas and you're absolutely unlimited in what you can put on it. Your business goals can sit right next to your travel goals, next to your money goals, next to your relationship goals. When you look at your board, you're not only thinking about the home you want to buy, but you're also thinking about how you're going to align your money habits to reach those travel goals and buy your first home. With a vision board, you begin to view your life as one full picture and it's your job to put all the pieces together in perfect harmony. Vision boards are powerful for many different reasons, but the biggest value you get from a vision board is the effect it has on your mindset. The second you decide to create a vision board you are making a consious decision to put yourself and your needs first. You make the decision to take control of you life. You assert your strength over your life. When you create your vision board, you paint a picture of your future - you tell yourself and the universe that this is what you will have. And even if you don't hit the moon, you'll surely land amongst the stars.